There have been plenty of successful partnerships between songwriters and female singers over the years. Bacharach & David and Dionne Warwick. Jimmy Jam & Terry Lewis and Janet Jackson. Stock Aitken Waterman and Kylie Minogue. This week in 1991, a partnership between a songwriting duo and a female artist who'd scored her biggest hits with their songs bore fruit again. 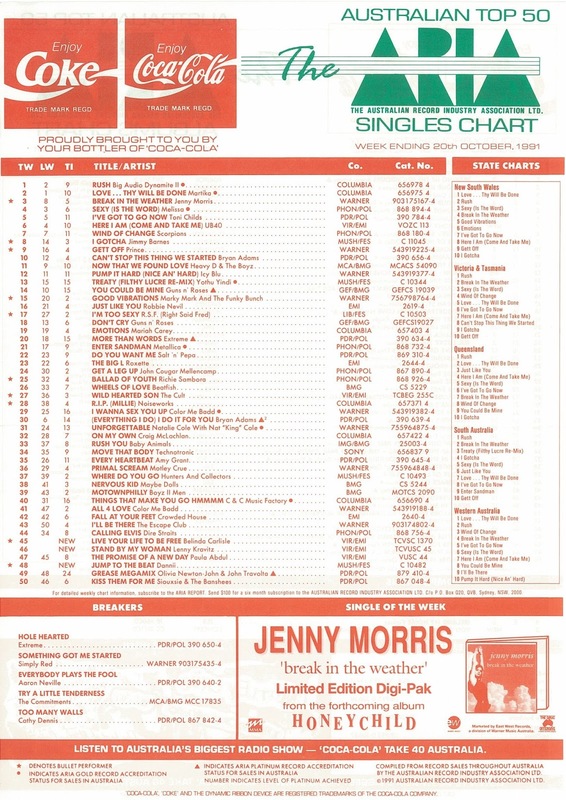 Meanwhile, at number 1 this week in 1991, Big Audio Dynamite II's "Rush" finally ascended to the top in its 24th week in the top 100, dislodging "Love... Thy Will Be Done" by Martika in the process. In less than a year, it was all over for Vanilla Ice, who could only limp into the very bottom of the top 100 with this cheesy spin on The Rolling Stones' "(I Can't Get No) Satisfaction". Actually only four-and-a-half minutes long, the final single from Mama Said Knock You Out sampled James Brown, Doug E Fresh and an Isaac Hayes piano hook also heard in Daniel Merriweather's "Change". The rockiest single from Real Life so far did better than previous release "See The Lights", but it was really beginning to feel like Simple Minds' best days were behind them. I don't have box office stats, but I feel like The Commitments was one of 1991's most successful movies in Australia. The two soundtracks released from the film about an Irish soul band were certainly huge - the first album reached number 2 and spent one week shy of a year on the top 50; the second volume peaked at number 6. The Commitments' version of the frequently covered 1930s tune first recorded by the Ray Noble Orchestra appeared on the original album and just missed the top 50, but another remake would succeed where "Try A Little Tenderness" failed in the coming months. It was just typical. Having suffered through Dannii Minogue's early so-so singles, "Love And Kisses", "Success" and "I Don't Wanna Take This Pain", Australia had to go and lose interest just as her music started to get good. "Jump To The Beat" was the first of two cover versions Dannii added to her drastically revised debut album for its UK release. Originally recorded by teen star Stacy Lattisaw in 1980, "Jump To The Beat" moved away from the new jack swing-lite of Dannii's first few Australian singles for more of a pop/dance feel, complete with rap by Technotronic's Einstein. Her earlier musical style had already been scrubbed off "Love And Kisses" and "Success" for their UK releases, while a remixed version of "I Don't Wanna Take This Pain" would end up as her fifth single in Britain. Quite why "Jump To The Beat" failed so badly in Australia is beyond me, especially given the fact that similarly styled singles by Melissa were doing quite well. The good news was that Dannii's second remake would receive a better reception in early 1992. He'd finally scored a big hit with "It Ain't Over 'Til It's Over" but it was back to the lower end of the top 50 for Lenny Kravitz with this latest single from top 10 album Mama Said. It'd be nearly a year-and-a-half before we'd see Lenny on the chart again - but when he returned, he'd do so with the biggest hit of his entire career. Next week: a hit from the '70s is given a remix, while a hit from the '80s is sampled for another new single. Plus, debuts from Red Hot Chili Peppers, Simply Red, Extreme and Stevie Nicks. Live Your Life Be Free was not the lead single in the US, Do You Feel Like I Feel was and it did chart in about the 70's. It was her last single to chart in the US and the album missed the Top 200 altogether. Didn't realise they skipped Live Your Life Be Free in the US but knew about Do You Feel Like I Feel's performance - have amended blurb. It was a dumb idea Vanilla Ice doing a rap over 'Satisfaction'. Never heard the Troy Newman, LL Cool J or Simple Minds tracks before. I prefer less-rocky Simple Minds. I wouldn't have heard the Commitments song since '91. It does seem strange that the Dannii song stalled at #48, despite her lack of post-'Love & Kisses' success here. I remember after my mum first heard the Belinda Carlisle song on the radio, she said she thought that it would "go to #1". Not quite; I guess it was a sign she was on the way out, though #13 isn't too bad. 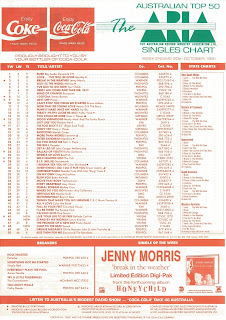 I never knew it missed the Hot 100 altogether; how strange. I much preferred the next single, which criminally underperformed. I think unlike most territories, Live Your Life Be Free wasn't the lead single in the USA as they decided to go with Do You Feel Like I Feel first and since that struggled to get to #73 they lost interest in the overall album and its singles. As above, didn't realise the US skipped Live Your Life... Copy amended. I was disappointed at the time with Belinda's declining success in the US, but at least she continued to chart (though not always as strongly as she deserved) here and the UK. I think "Live Your Life Be Free' is a very strong lead single, only eclipsed by 'Do You Feel Like I Feel' being even better. 'Jump To The Beat' deserved better, but at this stage Dannii was another whose fortunes had moved to the UK, and with the lack of airplay she received here, it's lucky she made top 50 at all. 'Stand By Your Woman", "Stand By Love' and 'God Only Knows' are the other non-top 50 new entries I like from this week (along with 'Too Many Walls' in the breakers. This is the US box office figure, though, right? 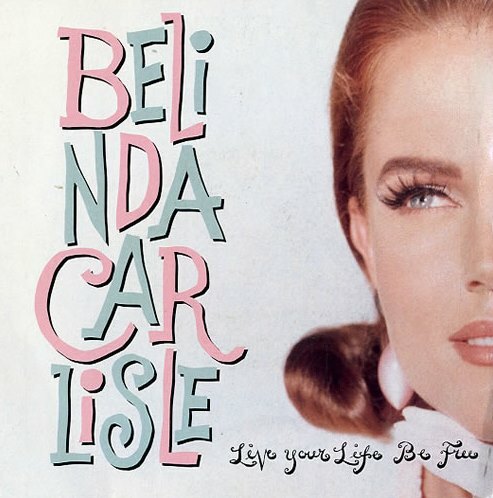 Live Your Life Be Free is my favourite Belinda Carlisle song of all time. I first heard it in the UK in late '91. Being in Canada (and heavily influenced by what was released in the US) I now know why.